The quarter cup of whole wheat flour gives the puffs extra crunch. Filling options include whipped cream, pudding, ice cream, or a special strawberry and cream recipe. Preheat oven to 400 degrees F. Lightly grease a baking sheet or line with parchment paper; set aside. In a medium saucepan combine water, butter, sugar, and salt. Bring to boiling. Add both flours all at once, stirring vigorously with a wooden spoon. Cook and stir until mixture forms a ball. Remove from heat. Cool for 10 minutes. Add eggs, 1 at a time, beating well with a spoon after each addition. Drop dough using a 2-tablespoon-capacity ice cream or cookie scoop or by heaping tablespoonsful 3 inches apart onto prepared baking sheet. Bake for 35 to 40 minutes or until a deep golden color and puffs are firm. Transfer puffs to a wire rack; cool completely. Cut puffs in half; if necessary, remove soft dough from inside. Spoon in filling. Replace tops. Sift powdered sugar over tops. Makes 10 cream puffs. Prepare as above, except spoon dough into a heavy resealable plastic bag. Snip a bottom corner to make a 1/2-inch opening. Pipe 20 to 22 strips of dough (about 4 inches long) 3 inches apart onto two baking sheets that have been lightly greased or lined with parchment paper. Bake for 30 minutes or until deep golden and firm. Cool and split, as in Steps 2 and 3. Fill eclairs as with the cream puffs. Makes 20 to 22 eclairs. 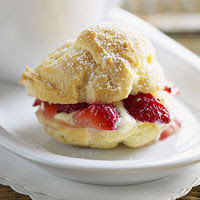 Nutrition facts are given for Cream Puffs filled with Pastry Cream and Black-Pepper Strawberries. Calories 309, Total Fat 19 g, Saturated Fat 11 g, Cholesterol 214 mg, Sodium 235 mg, Carbohydrate 25 g, Fiber 1 g, Protein 7 g. Daily Values: Vitamin C 21%, Calcium 8%, Iron 7%. This entry was posted on 6:31 PM and is filed under Desserts . You can follow any responses to this entry through the RSS 2.0 feed. You can leave a response, or trackback from your own site.